Democratic lawmakers are ramping up the pressure on their Republican counterparts to boost funding for non-defense agencies, and to do it quickly. 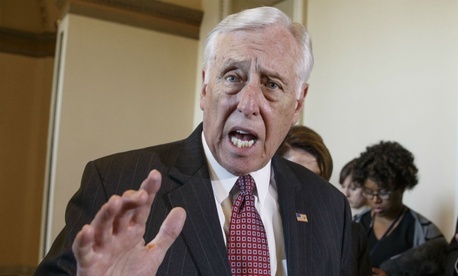 At a rally at the Capitol Building on Wednesday to end sequestration cuts, House Minority Whip Steny Hoyer, D-Md., and House Appropriations Committee Ranking Member Nita Lowey, D-N.Y., said a budget deal to lift spending caps should come in October, despite Congress having until Dec. 11 to reach an agreement. Hoyer later told reporters that negotiations should be completed before House Speaker John Boehner, R-Ohio, resigns from his post at the end of the month. Several Democrats from both the House and Senate spoke to a crowd of union members and other representatives of communities affected by federal spending to call for an end to the cuts that are taking full effect in fiscal 2016 after two years of temporary relief. The lawmakers emphasized that any dollar added to the Defense Department’s budget must be matched with an equal raise to non-Defense spending. “Sequester — that’s a complicated word that I tell people starts with S and stands for stupid — must be replaced,” Hoyer said. He added he was proud to “demand, not request, to demand that we get on a rational, workable policy,” to replace the current one that even some Republicans have admitted is faulty. Sectors like education, public health, housing, education, scientific research and national security from non-Defense agencies are crippled under the sequester caps established by the 2011 Budget Control Act, lawmakers said. President Obama has now promised to veto any future short-term spending bills like the one he signed last week to avoid a shutdown, and any long-term budget deal that fails to lift spending levels. If Republicans do not agree to higher budget caps, then they will force agencies to shutter altogether, Lowey said. “This austerity budgeting, combined with Republicans’ political games and internal dysfunction, risk causing another government shutdown,” Lowey said. The Senate leader has, however, indicated he will negotiate with the White House and Democratic lawmakers to exceed the spending caps. At the rally, Democrats repeatedly called for an agreement much like the one reached by Rep. Paul Ryan, R-Wis., and Sen. Patty Murray, D-Wash., which lifted spending levels and offset the costs with other long-term cuts. Sen. Chuck Schumer, D-N.Y., said any budget deal must meet three priorities: relief from “devastating” sequester cuts, a balanced approach to restoring Defense and non-Defense spending, and preventing “ideologues on the far right” from injecting poison riders into any agreement. Rep. Lujan Grisham, D-N.M., said unemployment in her state was rising because budget cuts were slashing government jobs. Emily Holubowich — co-chair of NDD United, an organization created to end sequestration that organized the Wednesday rally — said her group’s first goal is to restore spending to the baseline caps established by the 2011 Budget Control Act, rather than the sequester caps, which would boost non-Defense discretionary spending by $37 billion this fiscal year. Scientists, law enforcement personnel, health care professionals, the defense community and others represented NDD United at the event. Joining them were members of the American Federation of Government Employees and the National Treasury Employees Union. AFGE National President J. David Cox said sequestration was having a negative impact on the output of the federal workforce.